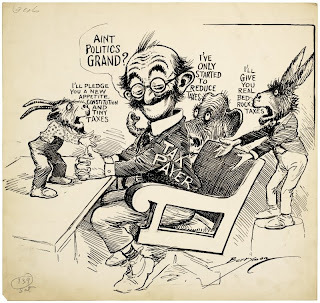 where the feature stated, “I hate political poems,” as he then proceeded to read what may or may not have been construed as a “political poem.” But this begs the question: Is there a place for politics in poetry? I would argue that any thought-provoking topic has a place in poetry (or art), be it nature, religion, unrequited love, or even politics. I would argue that the problem is whether or not politics is approached with open-mindedness by both the audience and the artist. Yes, that’s right. The artist too. Exhibit A. I once attended a reading where this very issue became more than just a hypothetical question. A young man, who said he had never attended a poetry reading before, stood up to read during the open mic portion of the evening. He introduced himself as just having returned from a tour of duty in Iraq, and he read a few very sincere pieces about his personal experience with war. The very next open mic reader of the evening stood up and read a bombastic, anti-war piece. Shortly thereafter, the young veteran stormed out the door. I’ve never seen him at a reading anywhere around town since. Exhibit B. I don’t know if this happens to anyone else, but often at readings, I’m approached by people (often those who don’t know me very well) who begin a political monologue with me. Regardless of whether or not I agree with the speaker, I’m immediately made uncomfortable because the speaker almost always approaches in such a way that he or she assumes that I automatically agree. I generally answer with polite silence, and the person strolls off happily, assuming, still, that I agree. Yes, I know that as writers, we’re supposed to espouse the values of freedom of speech and all that entails. Yes, I know that, as artists, we need to be open-minded to other, often conflicting opinions. But isn’t open-mindedness a two-way street? Doesn’t the poet need to be open-minded enough to recognize that even though someone may disagree, he or she shouldn’t be made to feel immoral, ignorant, stupid, evil, Neanderthal, or insert your disparaging adjective of choice here. Opinions can be stated and complex issues SHOULD be discussed, but in such a way that there is enough wiggle room left for someone to state an opposing opinion without being subject to—pardon the reference—a pre-emptive strike. Dogmatism, whether you’re talking about religion, politics, or the best brand of ketchup, does nothing to improve inter-human relationships. And more often than we care to admit, I think political poetry unfortunately veers into dogmatism. Shouldn’t poetry be opening the doors to discussion and free exchange rather than closing them to maintain a pool of homogenous opinions? or passed over at the proper time. terror, so many routine cries. of harmless fires drifts to my eyes. This is plenty. This is more than enough. So, check out the "longest poem in the world": Romanian student Andrei Gheorghe wrote a 'bot that grabs the real-time twitter feed, selects out posts that rhyme, and aggregates these into a continuous feed, with about 4000 verses added every day. I bought the wine and gushers. You bought the broken heart. Ready for the summer to end and fall to start. No, not really "poetry" in any real sense, but like a lot of auto poetry, it can be weirdly hypnotic. The tweet poem is a window into the collective consciousness, a look at an instantaneous zeitgeist which is equal parts quotidian and philosophical, romantic and mundane and cynical. And every now and then there'll be a good line. I used to have a handle on life. And then it broke. Desperately trying to cut down on the booze and smoke. *Maybe because I'm too lazy to actually write poems. "Scifaiku" is a poetic form codified by Tom Brinck with his 1995 Scifaiku Manifesto. Cleveland's notable haikuist Joshua Gage* just put together a little flyer, "The Universe in Three Lines," a sampler of scifaiku that was handed out at both the recent Haiku North America conference in Ottowa and also the recent Science Fiction world convention on Montreal. If you're interested, check it out. Josh notes "It's a neat little tri-fold sampler with some cool 1950's graphics and really excellent scifaiku." Or check out the scifaiku.com website. Poetry Back in the Woods begins its season with a presentation by ten women poets. Mary Biddinger is the editor of the Akron Series in Poetry, and the director of the NEOMFA. She is also co-editor-in-chief of Barn Owl Review. Susan Grimm`s poems have appeared in The Journal, Poetry East, Crab Orchard Review, and others. Her book of poems, Lake Erie Blue, was published by BkMk Press. She edited Ordering the Storm: How to Put Together a Book of Poems which was published by Cleveland State University Poetry Center. Bonnie Jacobson is Whiskey Island’s creative non-fiction editor and author of two poetry collections, Stopping for Time (GreenTower Press) and In Joanna’s House (Cleveland State University Poetry Center); and two chapbooks, On Being Served Apples (Bits Press) and Greatest Hits (Pudding House invitational). Her poems have appeared in The Gettysburg Review, The Iowa Review, Prairie Schooner, Rattle. Laura Kennelly, associate editor of BACH: Journal of the Riemenschneider Bach Institute at the Baldwin-Wallace Conservatory of Music, is an arts columnist in the Cleveland area. Amy Kesegich teaches English at Notre Dame College of Ohio. She has published poetry in Whiskey Island, California Quarterly, Frost Notes, Poetry Motel, White Pelican Review and Rubbertop Review. She has a chapbook, Spare Change, published by Bits Press. Lynn Powell has published two books of poetry, Old & New Testaments and The Zones of Paradise. Her poems have been included in 180 More: Extraordinary Poems for Every Day and The Norton Introduction to Literature (forthcoming) and have won recent awards from the Ohio Arts Council and the National Endowment for the Arts. Jessica Schantz teaches composition and creative writing at Cleveland State University. Karen Schubert is the author of The Geography of Lost Houses, and her poems have appeared or are forthcoming in 42opus, Fifth Wednesday, Zoland Poetry, Redactions, Reconfigurations and others. She received nominations for a Pushcart Prize and awards from American Academy of Poets and dA Center for the Arts. Amy Sparks,editor at the Cleveland Museum of Art, is the author of serious red (Cleveland State University Poetry Center) and queen of cups (Burning Press), and has published in Barn Owl Review, DMQ Review, Hobble Creek Press, Harpur Palate, and more. Jennifer Sullivan, Department Head of English at Barberton High School, is a poet from Akron, Ohio. Her poetry has appeared or is forthcoming in American Poetry Journal, Barn Owl Review, DIAGRAM, The Laurel Review, New York Quarterly, and Nimrod. Continuing the discussion of poetry of science, poets have found star-gazing to be a source of inspiration for years. In the era of Hubble images, exoplanets, and new discoveries in cosmology, there's more to astronomical poetry than just Keats' watcher of the skies and Whitman's learn'd astronomer. I just got a note from editor Emily Gaskin, announcing that Astropoetica just launched their summer issue. Astropoetica is a web 'zine devoted to poetry of astronomy, and the summer '09 issue features poetry from John Bennett, F.J. Bergman, P.S. Cottier, Mary Cresswell, Neil Ellman, Kendall Evans, Andrei Dorian Gheorghe, Taylor Graham, Tim Jones, S. A. Kelly, me, John Mirisola, Dan Mitru, Rae Pater, Dave Shortt, and Meg Smith. They also have a nice list of links to other sites with astronomy-based poetry. from a long weekend in Montreal*, where-- among other things-- I met poet Amal El-Mohtar, the other winner of the 2009 Rhysling for best poem. (photo of Amal and me); not to mention a number of other speculative poets, too many to name**. Amal is one heck of a poet. (She's also one of the three editors of the internet quarterly Goblin Fruit, which features mythic and fantastic poetry***). She won for her poem "Song for an Ancient City," a love-letter to the city of Damascus. What strikes me most about Amal's poem is how deeply and beautifully it is evocative of place. Amal placed third for the long poem Rhysling as well, collaborating with Cat Valente (a former Clevelander) on "Damascus Divides the Lovers by Zero," another poem deeply evocative of place. So I've been thinking of poetry of place recently. There is some body of poetry of place about Cleveland, of course-- in fact, the Deep Cleveland poem o' the week is a long-running attempt to capture the city in all its myriad fragmented poetic angles, somewhat channeling the spirit of D.A. Levy. Windfall has a nice little essay essay discussing poetry of place. "Paul Shepard thinks that the lack or denial of our connection to the plants and animals in a given place makes us crazy. Rootless, detached people are dangerous. On the other hand, sanity happens when people understand that where they are is who they are. " Any thoughts on poetry of place from the clevelandpoetics cabal? *for those of you who look for my usual post on clevelandpoetics every Sunday or early Monday, that's why I didn't post last week. **I was originally going to list them all, but it occurs to me that with my sketchy memory I'd probably leave somebody out, and that person would then assume I was snubbing them deliberately. ***"fantastic" is often used as a generic adjective meaning "really good," but in this case I mean it in its literal sense (not that the figurative sense isn't also applicable). If I were Edgar Allen Poe, perhaps I'd say "phantasmagorical." The dogs eat hoof slivers and lie under the porch. in a long mounting whine around her forehead and ears. terrible exhales from a tired horse. and no one explains the long uneasy afternoons. like the sides of horses in the hot pasture. rock to their feet and race or graze. the lonely, happy child home. of cicadas and the manes of horses. Kathleen Calby, Mike Goldstein and Brian Taylor will read & perform, followed by open mic. Kathleen Calby is a poet, but she won't be reading tonight. Instead she will bring quartz gem crytal bowls, ancient Tibetan singing bowls and Solfeggio tuning forks to create sound environments, what she calls poetry without words. Kathleen has been working with sound and harmonics for over ten years ----it will be a fascinating aural experience. Mike Goldstein writes that he will read satirical poems about current events and serious poems about Buddhism. He also will bring along his saxophone and bassoon and play them in unflattering positions. Mike has been a regular at Mac's readings for many years and was first featured in 1994. Brian Taylor is a poet, photographer and rider of his bicycle all around town. He has been writing and reading his work at venues throughout Cleveland since the early 1990's. He has competed in the Haiku contests at the National Poetry Slam and has participated in several Haiku Death Matches. This phenomenon was uncovered by Andy Woodruff, a cartographer (who lives in Massachusetts, damn fur’ner). Woodruff was driving through our state when he suddenly realized that Ohio has 88 counties, a piano has 88 keys, and, well, the next step is obvious..............create a musical map of our state on which each county is assigned one of the 88 piano notes. Woodruff’s map can play you through the drive from Cleveland to Cincinnati or through a variety of data-based organizations of the counties, from average family size to number of farms. But wait. Does this have anything to do with poetry? I think that any symbolization or substitution of one thing for another that transforms the original is poetic, but I’d like to know what you think. But wait again. Before you tell me what you think, I’ve borrowed Woodruff’s idea of using Ohio’s counties to create something else, but I’ve done it with words rather than musical notes. Is it poetry? Again, I’d like your feedback. 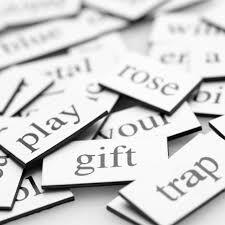 In my first pass at it, I found a poem with 88 words, including the title. Disappointment, by August Kleinzahler (a poet I highly recommend reading). I assigned each word of the poem to each of Ohio’s counties – the words of the poem in the order of the poem, starting with the title, and the counties in alphabetical order. Then I made what I’m going to call poems. I’ll let you read bottom up to enjoy the poems of the return trips. Lastly, sound poems. Trying reading them aloud and attending to how you feel as you do it before you dismiss them. What I’m getting at here are really questions about creativity (What is it? Does it serve a purpose and if so, what?) and meaning (Must creative work have meaning? Must it have the same meaning for everyone? Since humans are meaning-creating machines, can a poet leave it to others to create the meaning in a poem?). As a reward for reading through this post and thinking about these questions, please enjoy this rendition of She Blinded Me With Science, sung by online dictionaries. The main reason we didn’t have a Blind Review Friday Poem this week is because I lost our submission. I picked up my E-mails while on the road and accidently erased two days of correspondence into the emptiness of cyber nothingness. 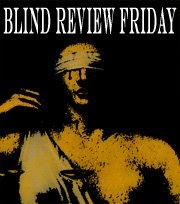 So, if you had a piece submitted for Blind Review Please re-submit. And if you’ve just been thinking about sending in a piece – please do so. We will resume our regularly scheduled BRF next week. I’ve had an inclination and interest in Eastern thought for many years. Long before I became a writer or a poet. And have found its teachings and practices a resource I go back to over and over for inspiration in a lot of areas of my life. A recent article I read in Shambhala Sun Magazine, the September 2009 issue reminded me it also could be a wonderful source of inspiration and creativity for writing. The article that stimulated those thoughts for me is titled, “Love, Lose and Anxious Times”, written by Norman Fischer a poet and Zen teacher from San Francisco. Unfortunately, the online link to the article is a mere teaser to the real thing, they really wish for you to buy the magazine. So I’ll have to share here, as briefly as I can, what I thought so interesting. The crux of the article deals with relying on spiritual practice to initiate change and deal with loss. The central idea being that when we feel most challenged is when we should most rely on simple regular practices that can support us, help us grow and help us get through tough times. The thought came to me in reading the article that these practices are especially useful to us as writers when we struggle; and some of them are already commonly recommended by writing experts for good writing. For many poets and writers our muses are often fickle and unreliable. Disappearing at times because of illness or stress or for absolutely no reason at all--seemingly coming and going with the wind. Often when we have trouble feeling inspired we stop writing rather than writing through the difficulties. Several practices are highlighted in the article which I feel can be relevant to a writer who is going thru a period of struggle. The first is journaling, an old standby for any writer. But here it is suggested with the purpose of removing blocks and negative thinking that obstruct by writing those thoughts and feelings down. An important point I think for someone trying to fight through writer’s block or move into a new area of creativity. Confronting, accepting, and “being” with the negative thoughts and feelings is a recommended way of working through them to the other side in eastern thought. Emptying out the mind by free writing for 10-20 minutes a day is also recommended, writing down what ever comes to you… unfiltered. The regular practice of carrying a notebook for writing down ideas and thoughts throughout the day is mentioned, and jotting down arresting words and phrases that catch our attention to use as writing prompts. Cueing off things you’ve read or written, writing down what you’ve been thinking or feeling in a coherent stream of thought, all of these act to free up stuck thinking and help creativity to flow again. Active listening and sharing is also an idea that was mentioned. Taking a thought or an idea prompt and bringing one or more friends together in a small group, after 5 minutes of silence and collecting your thoughts, have each person in turn share their thoughts spontaneously for 5 to 7 minutes… uninterrupted. The others just listen--no questions, no comments. Afterwards, one person simply reviews for the speaker in their own words what they heard him or her say. Listening to what you’ve said repeated back to you in another’s voice can be extremely illuminating. And meditation, even in its simplest form, quietly sitting, noticing the breath, noticing the thoughts and feelings, perhaps also the sound of the room, the stillness there, helps to allow other things to come to the fore. A reawakened sensitivity to your inner and outer environment is always good for a writer. I think often we start to have problems with inspiration when we’ve stopped hearing and seeing things that are naturally there in our environment; all those things that give texture and nuance to our writing. Sometimes, for one reason or other we lose touch with that. The New York Times blog TierneyLab ran a guest post on the Poetry of Science, focusing on the poems of Kimiko Hahn, and most particularly on her book Toxic Flora, coming out from Norton next year, a collection of poetry inspired by the science section of the New York Times. I'm a great fan of science poetry, as anybody who's read my work most likely already knows (about half of the poems in Iron Angels are about science, or science fiction, or both). There is an innate tension between science and poetry, the reflection of our society's perception of an opposition between the literary and the scientific ways of viewing the world; between, as C.P. Snow would put it, the "two cultures" of humanities and science. Yet (as I posted in a comment on the Tierney blog), poetry and science also go together; in their way, they are similar ways of doing the same thing: At its best poetry combines insight into the workings of the world with metaphors based on combining diverse observations– and science is a superb generator of both observations and insights. As I read Hahn's poetry, I'm struck by the insights she finds in biology, and in how apt and particular the correspondences between biology and day to day life. Her poetry deals with bumble bees, and Moray eels; with plants, and planets. "Others read the story of a pond or a patient the way she [Hahn] reads a poem. Interested in experiencing something foreign, she reads essays on science, on the world and on language. Whatever she finds intriguing and frightening becomes a poem. She writes a lot about extinction. She is writing a collection of poems inspired by science, called Toxic Flora. “There is poetic truth and factual truth,” she said. She is respectful of science and how the writers of science get their information correct. She is an artist because of the license to be irresponsible." (from Robert Flynn). Is there a contradiction between science and poetry, or a consilience? Do you find insights for poetry in the workings of science? As writers in general, we always hear, "you gotta work on your craft." There have been many times where I've questioned what that meant. As a poet, I'm starting to hear this more often. What does 'working on your craft' mean? Specifically. What is the best advice, without using this statement, you could give to a new poet? I'm sure the responses will be interesting. Collected Poems 1912-1944 by H.D. I've included three bilingual books both because I love their poetry and because their inclusion will be good for maintaining and refreshing my rusty Spanish. 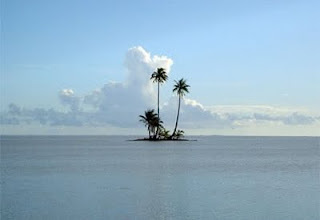 Why should I stop multitasking just because I'm on a desert island? Now it's your turn. Which ten books of poetry would choose to have on your island? And why?